Dex - PlayStation 4 Review — GamingWithSwag.com - Dads By Day, Gamers By Night. • Platform: PlayStation 4 (reviewed), Xbox One, PC. Gareth says: If I were to say that I was pleasantly surprised by this game, it may just be my understatement of the year. I had no idea about this game going into the review, which means I had no idea I was about to play one of the best games I have played in a very long time. I am hesitant when it comes to buying things on the Playstation Store - with how quickly prices drop, you can spend $24.99 on a game like Flockers on its release day, only to turn around and see that it is 80% off on sale before really even playing it. 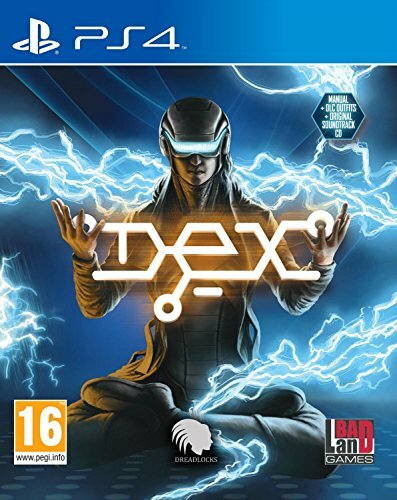 However the full price of $19.99 for a game the quality of Dex is still a steal in my opinion. Dex is a side scroller beat-em up, with added elements like combos and power moves that are unlocked through the skill trees. This is complimented by the addition of weapons which all act differently and require ammo to be used. Ammo can be bought or found throughout the game, but only guns are available until you make improvements in the talent tree. After only 30 minutes of playing this game I was left wondering why games like this have not been around since the SNES. Is there a genre of games similar to this that I have been missing out on? If so please let me know and I will start buying up everyone that I can. The fluid gameplay is complimented by a host of characters that all play a role in building the story. There have been too many games in recent memory where I could probably only tell you about three or four of the characters in the game. This game seems to be able to intertwine all of the characters while making you come back to certain ones over and over. This helps to build an atmosphere that leaves you wanting more and more, never leaving you with a dull moment. The top down shooter portions which starts when you enter cyberspace is just another fun addition of taking something that could get extremely boring throughout a game, and making it fun. This is also affected under the talent tree, making your hacking skills stronger as you place your points into that part of the tree. The looting reminded me a lot of Fallout, the gameplay of Battletoads, combined with the xp and leveling up system a modern day RPG. The story stuck to my true belief that games were better when developers and creators couldn’t depend on graphics to do the work for them. I had this game 100% complete in less than a week during a year when I have almost no time. I was hooked from the first leap off the balcony to the final tough choices to be made at the end of the game. I really hope this game sells well, as this is one of the games released this year that definitely has earned a sequel. Grab this one as soon as you can, you won't be disappointed! Click Here To Subscribe! ► http://bit.ly/Dreadlocks-Youtube Dex on Steam: http://store.steampowered.com/app/269650/ Follow us on Facebook ► https://www.facebook.com/DreadlocksEN Follow us on Twitter ►https://twitter.com/DreadlocksEN Visit our website ► http://dex-rpg.com Dex is a 2D, side-scrolling, open-world cyberpunk RPG with a focus on exploration and non-linear gameplay.